« Don’t Just Honor Them, Hire Them! How many times over the last week have you heard someone say “I just don’t think there has been enough post-election analysis, where can I get more”? Ok, nobody has likely said that to anyone, anywhere, in this country since November 6th. But just like there is “always room for Jello,” there is always a little more room for political analysis, especially when it comes with absolutely no political spin, and from someone uniquely unqualified to offer it. Examining town-by-town results from NH’s race for governor in the context of demographic as well as political variables provides some clues to the problems facing the NH Republican party. Using regression analysis to predict the percentage of votes both the Republican and Democratic candidates received in each of 230+ towns shows that several variables were significantly related to the percentage of votes each candidate received. I know there are all sorts of explanations and contexts that account for the election results but I am striving for some level of empiricism in an ocean of spin, even if some of the important context (issues) can’t be quantified and are left out. I am going for parsimony here. Of course the percentage of voters registered in each party in a town is the single largest determinant of the percentage of votes received by the party’s candidate, but after and controlling for that, what other variables were significantly related to the election results? The chart below shows the most important demographic variables (at least the most important of the 30 or so I examined). The bars are standardized results (z scores) that show the RELATIVE importance of the variables in determining the percentage of the vote that went to the Republican candidate. Results show that sometimes, empiricism supports rather than refutes conventional wisdom. 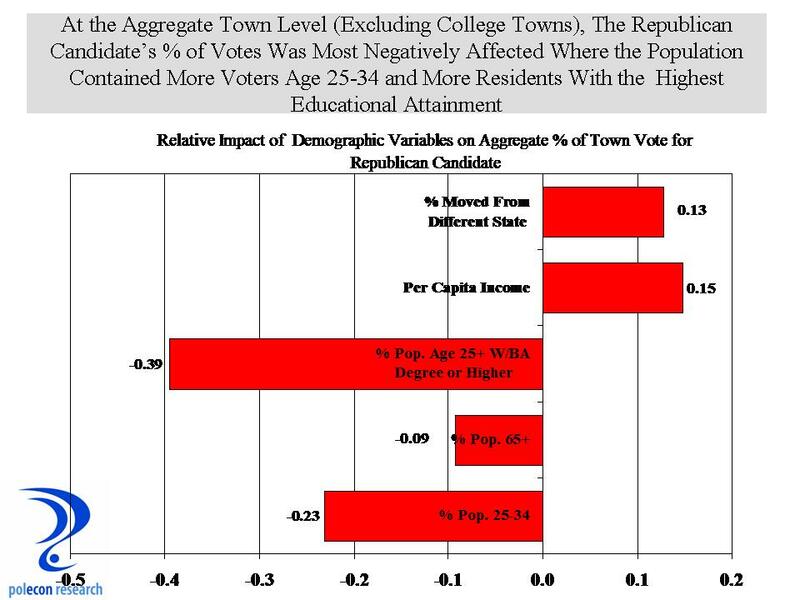 The variable that has the strongest negative association with the percentage of votes for the Republican candidate (controlling for all other variables) is the percentage of the town’s population age 25+ that has at least a bachelor’s degree or higher. The percentage of the population age 25-34 also has a strong, statistically significant negative association with the vote received by the Republican candidate. On the plus side, higher income towns and towns where a higher percentage of residents moved to NH from another state (again controlling for all the other variables and with a caveat that this data include only those who moved to NH between 1995 and 2000) were both associated with higher percentage totals for the Republican candidate. The percentage of households with children in a town just missed a statistically significant relationship with higher vote percentages for the Republican candidate. In combination, these three variables point to Republican strength in higher income communities that also have a high percentage of families with children and that have a higher percentage of households that moved into NH from another state- that is a good description of many of NH’s, bedroom communities near our southern border. It is (or was until recently) also a pretty good characterization of the bulk of NH’s in-migration from other states. The notion that movement to NH is positively related to Republican vote totals suggests that other explanations (demographic but also issue-based) besides “NH is becoming Massachusetts north” may be responsible for NH’s emerging blue hue. In any case, in-migration to bedroom communities slowed a lot this past decade. More troubling for Republicans is the negative association between higher educational-attainment and the percentage of votes received by the Republican candidate. A higher percentage of population aged 25-34 is also negatively associated with the percentage of Republican votes, although the true meaning of this is harder to glean because this age group is also associated with a higher percentage of independent voter registration. Whether it is age or lack of party affiliation that is the cause, however, votes for the Republican candidate were negatively associated with a higher percentage of individuals in a town in this age group. None of this is an epiphany, but sometimes you just have to document the obvious (even if only to make it patently or inherently obvious) in order to really believe it. This entry was posted on November 13, 2012 at 2:38 pm and is filed under Election, Politics, Uncategorized. You can subscribe via RSS 2.0 feed to this post's comments.